There has been no official determination on the Fire Chief front but there is much speculation and rumor, so far. In the last City Council meeting, Jim Lukas City Manager of Franklin was present and the speculation, from what, we have heard, was that the Fire discussions would be a hot topic during the council meeting. From what we have seen from online and from certain people in public attendance it was not discussed openly. 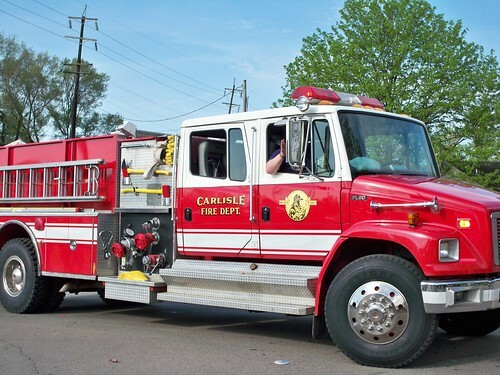 Rumor has it that the City officials for Carlisle made it known that Carlisle has made their decisions on how they would replace recently resigned Fire Chief, Greg Wallace and proceed with the current Fire Department situation. The rumor is that Carlisle is looking to hire a part time Fire Chief, part time. That fire chief would be current full time Fire Chief Michael Hannigan of Lebanon Fire Department. Rumor has it he will keep his full time position with Lebanon and serve part time as Chief of Carlisle's volunteer fire department. Jason Faulkner, Franklin City Council member, has also posted this rumor on his blog site. Click here to view his article. So with many already talking about this rumor it will be interesting to see if this the direction City Administration for Carlisle is taking. We have reached out to City Manager, Sherry Callahan, for a potential update and some validity on which direction the city is going. It is not Chief Hannigan who will be the part time chief for Carlisle it is Krist Wyatt who is a captain I believe for Lebanon and works for Hannigan. The city is correct but the name of the person is wrong in this article. Thanks for your update Anonymous, that is why we speak of all of this as what the rumor is. We hope that we hear more from the City for an official update!! Thanks for your readership! Council wants to go all the way to Lebanon for a Chief? No faith in the current staff? Bob Miller has been Assistant Chief before Greg Wallace was there, they trust hime with the lifes, property and equipment of the city but not as Chief? If he does not want it, does this mean Wallace never delveloped anyone to handle it? Maybe no one wants it because of beind the scene issues? It is all rumor till proven valid. I think Bob Miller would make a fine choice if he is interested---since the city has made its decision to hire a new fire chief. He's obviously qualified and has clarly made the kind of commitment that it takes to run an effective fire department. I find it very interesting that I served an entire year on the ad hoc committee and the option of hiring another fire chief was never even proposed by council. Council did not hire the fire chief. That is a choice made by the city manager. We did NOT have ANY say in the matter. The city paid $1000 a month for someone to do all the paperwork and computer entry for Greg Wallace, I wonder if anyone gave Bob Miller that option? He certainly has earned the position of chief, even if it's only an interim chief rather than go to another city for another"part-time full-time chief!" If it is true that the city manager did not even consult with counsel before hiring another fire chief, this in itself is a sad state of affairs. I still can't quite believe they absolutely did not acknowledge let alone accept or refuse Franklin's offer to run the fire department with whatever funds are currently available. I can hardly wait for next year's Levy to be placed on the ballot. Congrats to Mayor Tim Humphries, Carlisle City Council and the City Manager for hiring a person that is committed FULL TIME to Lebanon and only PART TIME to Carlisle. This is just what we need in Carlisle right now. Now everyone is laughing at Carlisle over this ridiculous decision. Mayor Humphries and the City Council may try to tell you - they did not hire the fire chief. That is a choice made by the city manager. DO NOT BELIEVE this because the Mayor and City Council hired the City Manager, Sherry Callahan. It will be interesting to see if Mayor Tim Humphries and City Council ever take responsibility for this. One more story WITHOUT a name. Thanks for your time and efforts. "Election time", How come everybody can Name Mr. Humphries and not name any of the other Council people by name, Like Mary Ann Thompson, Randy Winkler, Dennis Bowles, Carrie Branson, Jennifer Long and James Lickliter. All SEVEN are equally responsible for overseeing the New City Manager and all SEVEN should be checking what that Manager is doing at all times. Day to Day operations is the Manager's job plus what Council instructs Her to do but I believe hiring any Department Head should include the full input of the council. Maybe the council should sit the new Manager down and tell her exactly what they want her to do because Council is The Manager's Boss. Carte Blanche for the City Manager will not work, it leads to gray areas in Goverment and Lawsuits against the City to pay for a Manager's mistakes. This City run by the City Council thru the City Manager. The Manager serves at Council's Pleasure. P.S. The Mayor of this City is only a ceremonial position today and has very little power at all,One vote of council, and conducts council meetings (when not being interrupted) and Mayor's court is run by a lawyer. Besides ,Mr. Humphries has more or less been shut out by the other six council people since before his election to office.